Source: Texans for Public Justice, 2011. 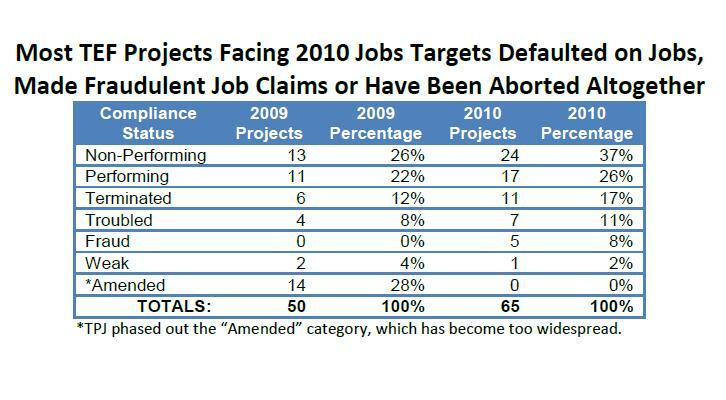 A new Texans for Public Justice report (available here) finds that most of Governor Rick Perry’s Texas Enterprise Fund (TEF) projects failed to deliver on their 2010 job promises. The study analyzes compliance reports filed by 65 companies that received $350 million to create Texas jobs in 2010. A summary that Governor Perry’s office published in August suggests that $440 million in taxpayer TEF grants have created 59,600 Texas jobs. Perry claimed in an October presidential debate that TEF has produced 54,600 jobs. Putting aside five TEF projects that TPJ asserts are fraudulent job claims and a sixth project that appears to be undergoing an audit, TPJ found evidence that TEF had created 22,349 jobs by the end of 2010. That number amounts to 37 percent of the job claims made by the Governor’s Office. One project claimed “new” jobs that had hiring dates predating its TEF contract. This entry was posted on November 9, 2011 at 2:18 pm and is filed under Disclosure, Jobs, Subsidies. You can follow any responses to this entry through the RSS 2.0 feed. You can leave a response, or trackback from your own site.